On the 12th of February, the app will do far more than take you to work and back. In fact, it’ll take you as far away from work, as possible. Uber is partnering with Musafir.com, to send you on an all-expenses paid weekend getaway* for two, to ring in Valentine’s Day. Simply fire up the app to request. After that, it’s hello Thailand. Or Udaipur. Or Sri Lanka. You get the idea – 164 holidays to 18 mystery destinations, on-demand. Slide over to the MUSAFIR view and simply request! Ensure you and your friend keep your passport and/or Government ID proof handy while requesting – you will have to share the details on selection. The flights are booked for the same evening – so make sure you and your friend are ready to leave! 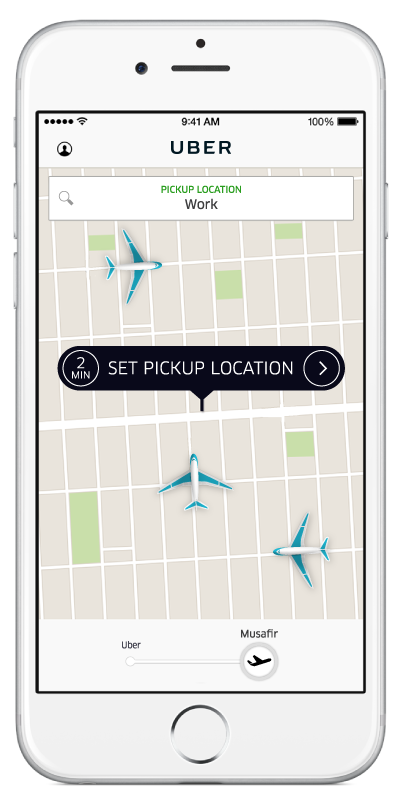 With one tap of a button in the app, bid adieu to the daily grind. It’s time to fly away! All riders engaging in this contest must strictly be over 18 years of age. Whilst these services have been facilitated by Uber and Musafir, the services itself are being provided by third party airlines and hotels. Accordingly, such airlines and hotels shall alone be responsible for the services. For domestic travel it is mandatory to carry any government issued valid photo identification such as PAN Card, Election Card, Passport. The international travel package is valid for Indian passport holders only. For all international travel it is mandatory to have a passport valid for 6 months from date of return. Handwritten passports and passports valid for 20 years are not accepted in many international locations. Hence the passport should be machine written and validity should not be more than 10 years. Please read the detailed terms and conditions listed here.